Tutorial Support – how to Contact the Trainer? As an organization intensively involved in eLearning we permanently check the quality of our courses and try to amend the quality. One issue is the communication – here mainly the contact between the learners and the tutor. In fact, we were sure that the best method is a forum where learners can ask the trainer. The result of a questionnaire (conducted in the frame of a Grundtvig Multilateral Project) the results prove our current opinion – but not fully. Do women prefer to talk? In an eLearning course, there is always the problem of the support of the learners. Sometimes, learners want to contact their tutor or the have a problem and need help from their trainer or teacher. Which method – do you think – is the best one? Here are two synchronous and two asynchronous methods mentioned. The behavior is similar: the majority prefers forums. Here the preference of male participants is about 10 percent higher as the female answers. 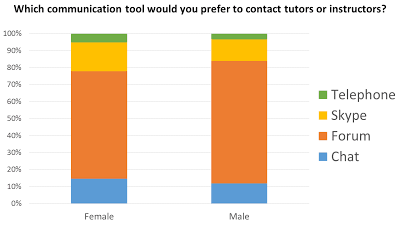 Female participants in the opposite show a higher percentage of skype preferences – they prefere to talk. If you check the differences between synchronous and asynchronous communication you will find a six percent higher level of preferences for synchronous methods at the female users.